The ITC granted Apple an import ban that will prevent HTC from selling its phones in the US with the feature beginning April 19, 2012. HTC will either need to remove the functionality or work with Google to implement it in a non-infringing way. Removing the feature "would put HTC at a competitive disadvantage as compared to other smartphone makers, including other Android device makers," reports FOSS Patents writer Florian Mueller. "Out of ten patents originally asserted, Apple finally managed to enforce one, and it's one of medium value," Mueller added, noting that "a much broader and potentially more impactful patent on realtime signal processing was not deemed infringed. That one could have had much more impact on HTC and, more generally, Android than the data tapping patent." Mueller observed, "it's a starting point, and let's not forget that this is just the first of dozens of lawsuits Apple has already brought against the Android platform. There's a learning curve involved with anything, and patents need to be battle-tested. Chances are that Apple's lawsuits will become more effective." Apple's Advanced Technology Group invented Data Detectors in the mid 1990s, allowing an operating system to recognize formatted data (such as a phone number or email address) within an unstructured document, enabling the user to take action upon the data recognized. The feature was added to Mac OS 8 in 1997 as a contextual menu plugin (above), but didn't make it to Mac OS X until Leopard 10.5 in 2008. Along the way, Data Detectors evolved into an automated technology initially called LiveDoc, where recognized data was automatically highlighted. On Mac OS X, the feature enables users to perform actions such as clicking on information (such as in an email signature) to automatically create a new contact entry or selecting a highlighted date in order to set up a new calendar event. Since Snow Leopard in 2009, the feature has been activated for any documents managed by Core Text. 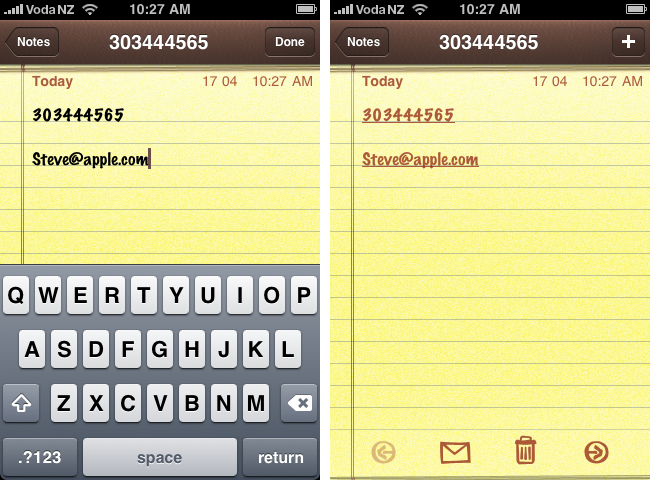 That same year, iOS 3.0 also incorporated the technology, allowing users to see email addresses and phone numbers as hyperlinks that can be touched to place a call, send a text, or compose an email.